How Big Should Your Handbag Be? Big bags are great, we all love them. A big bag like a tote can take everything we need for work or play. They are both practical and flattering for most women, making us look slimmer and more petite by comparison with the size of the bag. Since the fashion for big bags began our handbag has been even more versatile, often replacing briefcases for professional women as they find their tote makes a far more elegant and better looking work bag. Mothers of small children no longer have to lug around unstylish nappy bags but can find designer bags big enough to fit everything in and look chic too. The downside of the big bag has been pointed out many times by doctors, who see more and more back pain caused by these very same big bags, as we fill them with everything but the kitchen sink and then carry a huge weight around on the same shoulder all day long. The trouble is, if we have room in our bag, there is always something we can think of to put in it. We put in the essentials and then add a few more things just in case. We slide in a book or two one day and find we’re still carrying them around a week later, never having even looked at them. Unless we are very organized types who tidy out our handbags every few days we can find that we’re carrying around a whole lot of weighty extra things in the bottom of our wonderful roomy handbags, which are dragging us down unnecessarily and doing long term damage. The ideal weight for a woman’s handbag when full is said to be just 1kg or 2.2pounds. A fully loaded big bag could weigh as much as 4 kg or even more, especially if we like our gadgets and carry a Macbook everywhere as well as paperwork. No wonder back pain, headaches and even nerve damage can result when we are carrying such a heavy bag around all day everyday. So how can we enjoy our big bags without them becoming a burden for our backs? When choosing a big bag think about how much it weighs empty. There can be a huge difference according to what leather is used to make it. 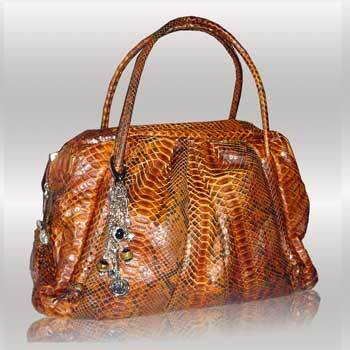 The lightest leathers are exotic leathers like python or ostrich, which, while they are tough and resilient, weigh a lot less than calfskin and other leathers and can reduce the weight of the bag considerably, as well as being extremely elegant and attractive. The simplest answer is to declutter. Only carry the essentials, however much space is left over. If you are disciplined it can be done! However, most of us will go down the slippery slope of adding just a few more things, until we are back to being weight-lifters in training. If this sounds like you, give yourself some help by getting a bag that is big, but not too big – one that fits in the essentials without leaving room for too much extra. Make a list of all the essentials that you think you need to carry everyday. Make another list of things that you sometimes need to carry in your handbag. Get your current handbag and lay out its contents on a table. How many extra things are there in there that aren’t on either list? Do all your essentials fit in your current bag? Assemble all the things on your list and see how much room they will take up. Do you need a bigger or smaller bag than your current handbag? Try weighing your whole collection of things to see how realistic you are being. If they are too heavy then you could consider using compact versions wherever possible: a smaller notebook, travel size make-up containers, a lightweight hairbrush. What you need is a bag that fits all your essentials with room for the ‘sometimes’ extras, where all these things fit comfortably. If you have loads of extra space it just invites you to fill it up with unnecessary ballast that will weigh you down. When buying a big bag you should also look at how comfortable it is to wear. A big bag should always have a comfortable wide strap or handles that will spread the weight over your shoulder and will stay in place without slipping about and causing more strain. Bags with long straps that can be worn across the body are the best for even distribution of weight (though this often isn’t practical or stylish), while carrying a heavy bag hanging from the crook of your arm for long periods is the worst for your back, so look for a good quality bag with detachable shoulder straps for when you are schlepping it across town. It looks as if our love affair with big bags is set to continue, with oversize bags still well in evidence on the catwalks in the last fashion shows, so make sure that your big bag will last for years, and that your back will too!